Inventory. It’s difficult to think of a single topic more important to more people than this. Buyers, Customer Service, and Production Planners all care about what’s available and what isn’t. And, of course, there’s the warehouse personnel that keep everything flowing whose lives revolve around inventory. 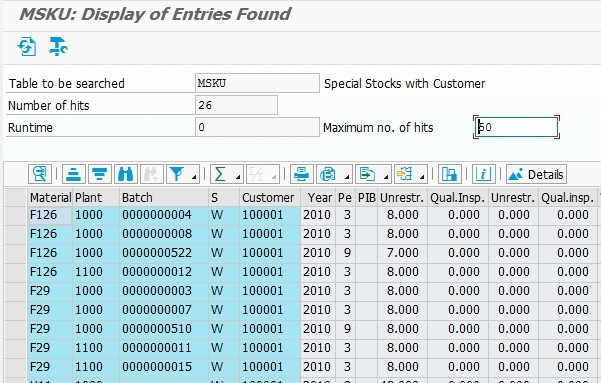 For most situations, a quick stock overview is sufficient, but many times you need to get a closer look at inventory through queries or custom reports. Here are the tables you need to know about. I’m not going to cover the standard Material Master tables — MARA, MARC, and MVKE. Instead, I’m going to focus only on those tables containing inventory values. Any screenshots below are going to be from transaction SE16N, my go-to transaction for quick table queries. Table MARD is probably one of the more useful ones. It contains all of the basic inventory levels for each material on the plant and storage location level. Keep in mind that this table will have records for ALL Material/Plant/Storage Location combinations; this means there are potentially a LOT of records. Also worth noting is that many of them may have Zero (“0”) inventory levels, so you may want to be specific in terms of what types of inventory you are looking for. In addition to Unrestricted stock, most other stock types are included in this table — Stock in Transfer (between SLOC’s), Quality Inspection, Restricted, Blocked, and Returns. Don’t be confused; there are also these same stock types listed in this table with values from the previous period. Use the records that are most appropriate for your needs. In most cases, it will be the first set of current-period numbers. Table MCHB expands upon the previous table by adding in Batch quantities to the Material, Plant, and Storage Location. The values in this table further define the values in table MARD. This means that the quantities in MCHB are included in MARD and should not be considered in addition to MARD. All of the other stock types in MARD are also included in this table along with prior-period values. 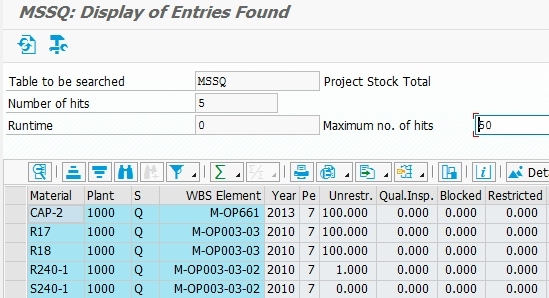 Both tables MSSL and MSLB are related to material stored at a vendor. In SAP, this is considered Special Stock type ‘O’. The most common scenario to require type ‘O’ is subcontracting being performed by a vendor. 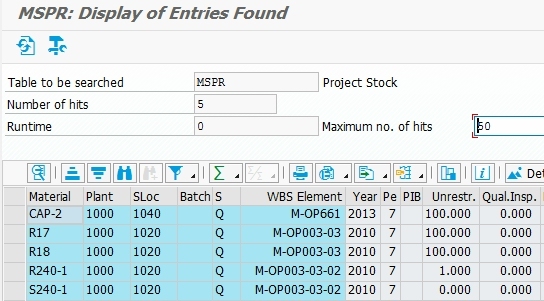 As with the first two tables I mentioned above, table MSSL contains inventory levels at a Material/Plant/Storage Location level and MSLB adds in Batch quantities to further define what’s in MSSL. 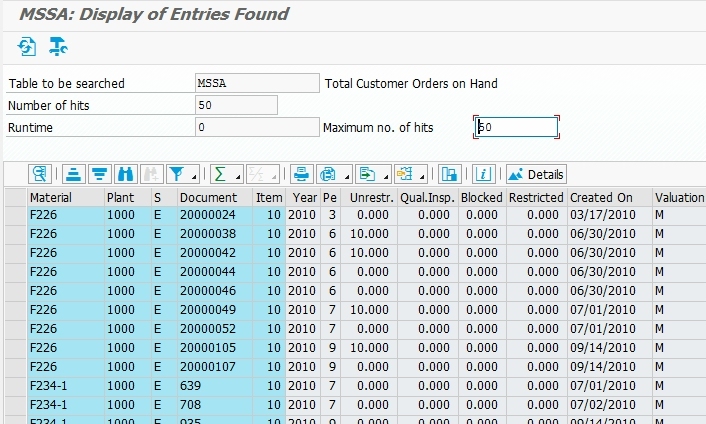 Table MSKU contains inventory levels for owned material at a customer site. Most commonly, this would suggest a Customer Consignment process which uses Special Stock type ‘W’. This table can also store Returnable Packaging currently located with a customer which is Special Stock type ‘V’. As expected, the table key contains the basics — Material, Plant, and the Special Stock Indicator. In addition, the key also contains the Customer Number and Batch number. The two main stock types contained in this table are Unrestricted and Quality Inspection stock. As with the other tables, prior-period values are also included in this table. Sales Order stock is typically non-valuated and is directly assigned to a Sales Order Line Item. 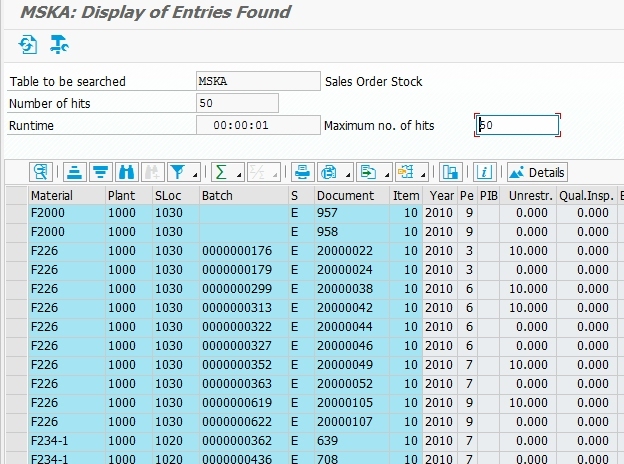 MSSA contains the Material/Plant/Special Stock/Sales Order values whereas the MSKA adds Storage Location and Batch-specific values. Indicator, and WBS Element in the key. Like others above, MSPR adds Storage Location and Batch-specific details. Both tables allow for Unrestricted, Quality Inspection, Blocked and Restricted stock types. Table MKOL stores vendor-owned materials. There are two main scenarios that utilize this table. The first, and probably most common, is Vendor Consignment. In this business process, you store vendor-owned materials at your physical location and “purchase” them when consumed. This process utilizes special Stock indicator “K”. The other scenario is for the management of Returnable Packaging owned by your vendor. This is common in many industries but seems to be most prevalent in automotive. Your vendor ships items to you in specially designed reusable packaging which is intended to be sent back to your vendor. This process uses special stock indicator “M”. The key fields in MKOL are Material, Plant, Storage Location, Batch, Special Stock, and Vendor. 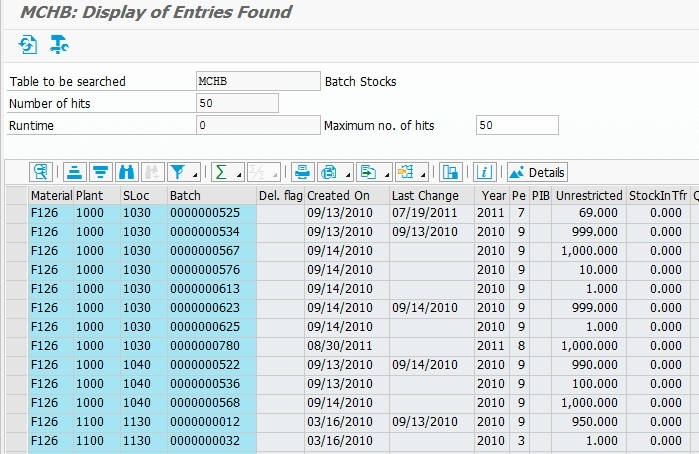 I hope this article sheds a little light on how SAP stores the various types of inventory. If you know of another useful inventory-related tables, please drop a note in the comments. Found the answers to my questions !! thankyou for sharing .. Awesome, Mick. Thanks for taking the time to comment. MARC also contains stock and MBEW is important for the value of the stock. important is also how SAP stores the stock and how you should read it. It helped…Thanks for the detailed Info.